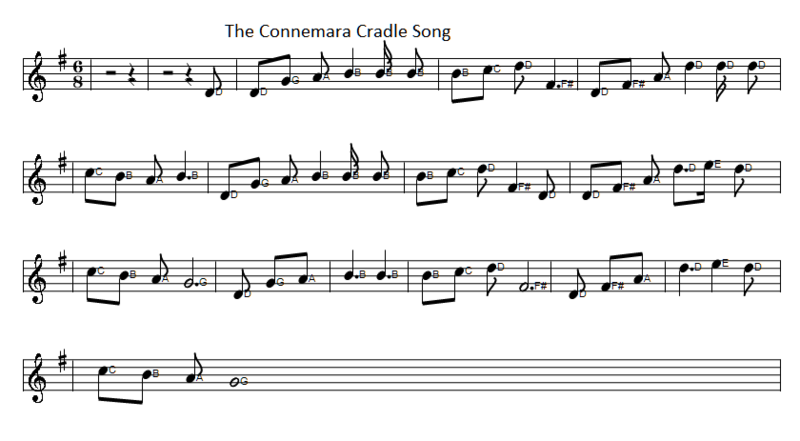 The Connemara Cradle Song Sheet Music And Tin Whistle Notes.This one is a lullaby from the West Of Ireland. A Lullaby song was, and perhaps still is used to to send babies to sleep in their mothers arms or by gently rocking them in the cradle. Regarding the level of difficulty, this one is in between beginners and intermediate whistle playing. Recorded by The Clancy Brothers with Tommy Makem. Connemara Cradle Song easy letter Notes. 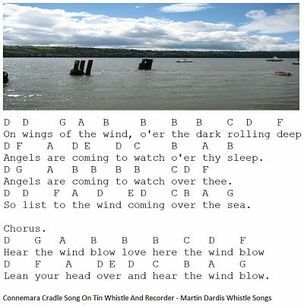 Connemara Cradle Song sheet music Notes For Tin Whistle. To be played on a D whistle. The sheet music below is slightly different than the notes I'm playing on the tin whistle.